Anyone who has seen an episode of Seinfeld will know about New York’s obsession with the humble bagel and along with pretzels and doughnuts, it’s one of those must-try food experiences for any visitor there. Although Glick’s Bakery has been baking them fresh each week since the 1960s, over the past few years bagels have joined other American food experiences migrating to our shores en masse. 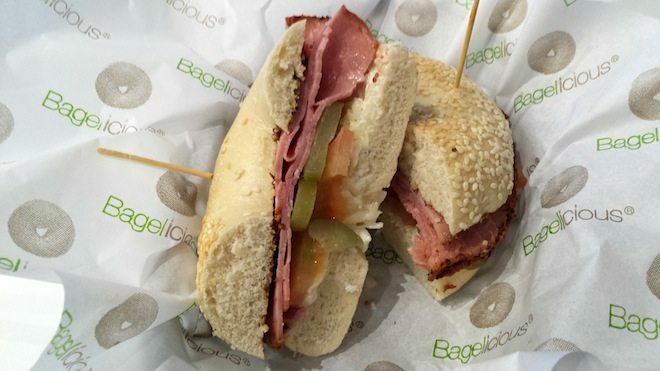 One recent addition to this food scene serving up bagels is Bagelicious. 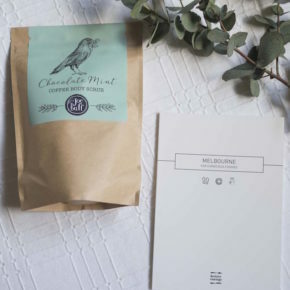 Their first store in Elsternwick has recently acquired a sister on Glenferrie Road, Hawthorn, positioned amongst Huxtaburger, Fonda Mexican and a range of other top notch eateries. 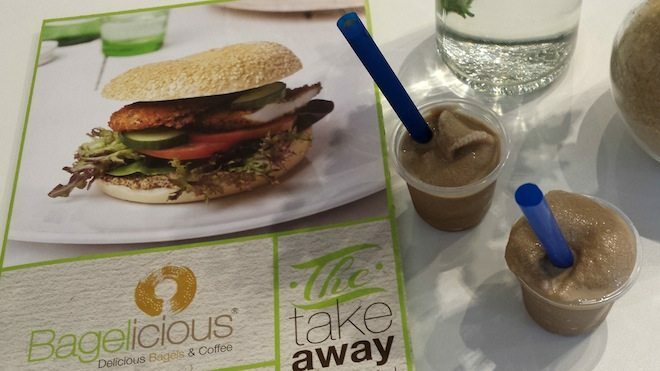 We were invited down to sample some of what Bagelicious has to offer. It was 11am on a Sunday morning and despite being towards the end of the Glenferrie Road shopping strip and at risk of not catching the passing trade, it was bustling; always a good sign. Customers have a choice of bagel styles, from plain, sesame or poppy seed, onion, cheese, wholemeal, rye or blueberry, to name just a few. Then follows an equally extensive choice of accompaniments and fillings, cold or hot, breakfast, toasted etc. 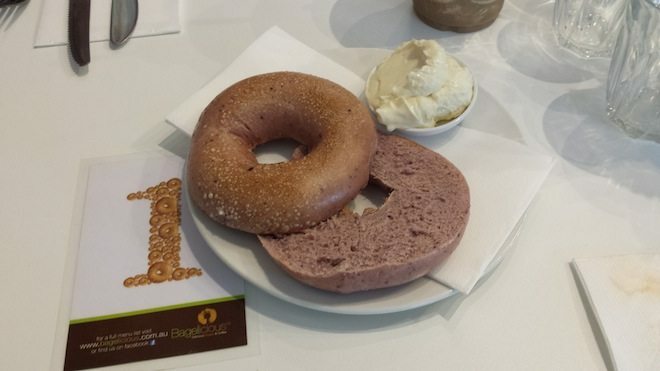 Gluten free bagels are also available, as is a kid’s menu, and for those watching the carbs, there is a selection of salads, soups and quiches. The drinks menu is just as extensive and features a range of iced drinks, frappes and smoothies. They have thought of everything and while there is a risk that being everything to everyone might result in reduced quality, we are happy to say that this is not the case here. 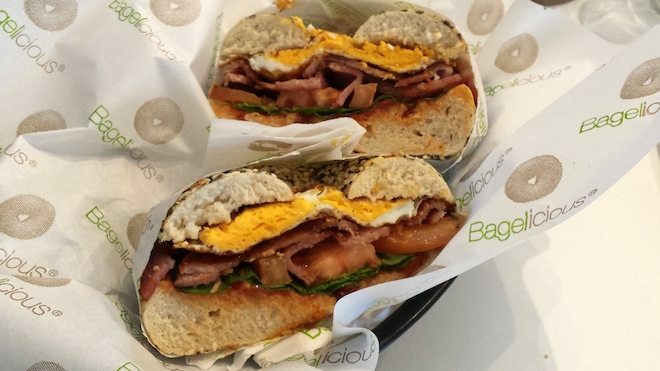 With its clean fit-out, well-priced options and friendly service from owner Yonatan, Bagelicious is a welcome addition to the Hawthorn food scene. Welcome! 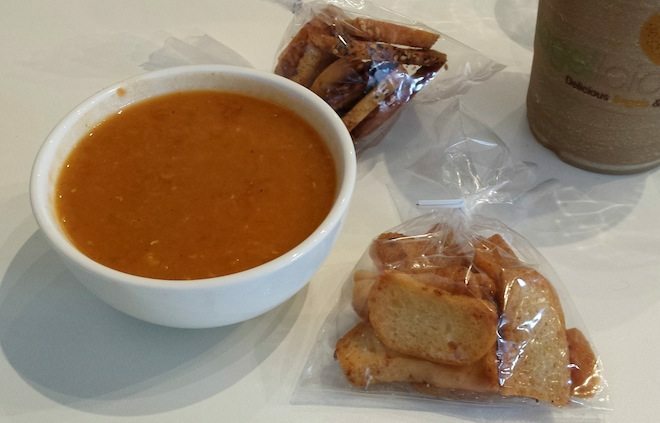 Lentil soup with super crunchy and garlicky toasted bagel croutons ($7.50) – the soup was flavoursome and the croutons very moreish. The deliciously creamy slurpee-style Iced Coffee ($6.50) is made according to a secret recipe with no cream or ice cream. A satisfying BLT (with an egg at my request) on a sesame and poppy seed bagel ($9.00). New York flavours hit Hawthorn with my stand-out: the Reuben on a sesame bagel with pastrami, mayo, mustard, sauerkraut, tomato and pickles ($9.90). To finish off, a sweet blueberry bagel with housemade honey-sweetened cream cheese ($4.50). Deliciously simple.